Taking over from the 75 as flagship of Fleming’s range the new Fleming 78 is sure to be a fearless and accomplished liveaboard cruiser. Her semi-displacement hull is propelled by twin MAN 1,550hp V12s (1,000hp MAN’s are also available) which should make for comfortable cruising anywhere between 8 knots and 20 knots whilst top speed should be a useful 23 knots. Tony Fleming, the founder of Fleming Yachts, tests every boat he builds to the limits, as was seen in the pages of MBY with his trip to Iceland on his Fleming 65, Venture II. Back to the 78 and the hull has been altered from that of the old 75 by extending the hull beneath the bathing platform, which itself is a foot longer than the 75’s, and also adding a bulb to the bow. The keel has also been lengthened for better protection of the running gear and to improve the boat’s tracking. On board you can expect the usual exceptional levels of fit, finish and attention to detail whilst sleeping accommodation comes in the form of a spacious owner’s stateroom amidships and two ensuite guest cabins. 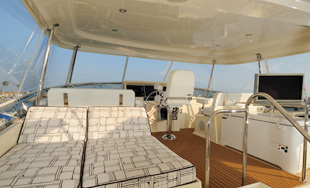 The deck spaces are split between the two-level flybridge and aft cockpit, both of which are perfect for dining and lounging around in the sun. 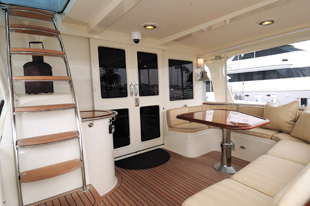 The lower section of the flybridge is equipped with a wet-bar featuring a BBQ, ice maker and fridge whilst the aft section is reserved for up to a 15ft tender. It wouldn’t be a true Fleming without plenty of hi-tech cruising gadgets on board. Like the Boning monitoring system which keeps an eye on everything from navigation lights to tank levels and water pressure and there is also CCTV fitted throughout the entire boat for extra piece of mind. The 78 will start (with the largest engines) from £2,783,858 and it’s comprehensively equipped with hydraulic thrusters, stabilisers and the aforementioned Boning electronics. Hull number three should arrive in the UK in the early summer and you can guarantee that MBY will be at the front of the queue to test it.